Near here was located the first town and county seat in Saline County. Situated on Swan Creek from which it took its name, Swan City held prominence for only a few years. The first settlement buildings, including a store and a sawmill, were constructed about 1865. In 1865, William Remington donated the land on which the town was located. The first meeting of the Saline County Commissioners took place there at Cline's Mill on February 17, 1866. Swan City was officially platted on October 8, 1866. Swan City grew to a community of some 200. Its thriving business section included a hotel. The O'Connor Circus spent a few winters in Swan City. In 1871, the county seat was moved from Swan City to Pleasant Hill. That same year, the railroad was being built through the Blue River Valley, two and a half miles from Swan City. Most of the town's business community wanted to be near the railroad and moved to either DeWitt or Wilber within two years. The last vestige of Swan City was the flour mill which continued to operate until it burned in 1891. Swan City thus joined the ranks of ghost towns. 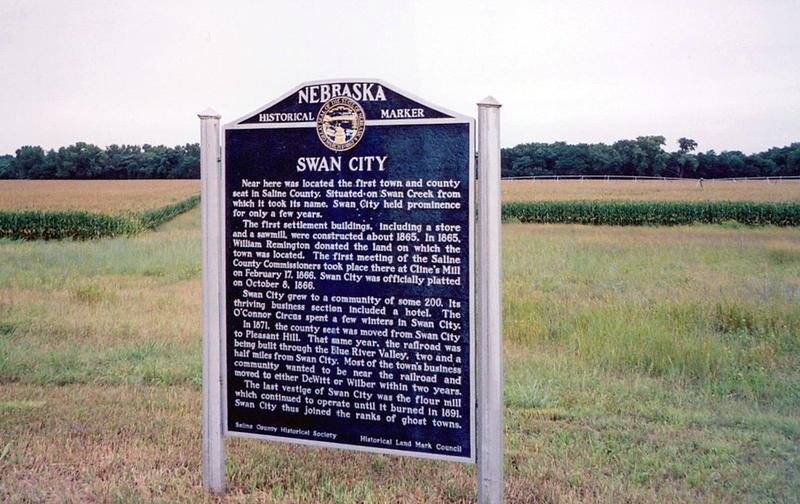 “Swan City,” Explore Nebraska History, accessed April 19, 2019, https://mynehistory.com/items/show/437.